Feeding picky eaters is one of the most common challenges that parents can face. It can make mealtimes a nightmare, but it can also raise concerns about whether your fussy eater is getting enough nutrients. Kids have a higher demand for nutrients compared to adults, as they are still growing. But when it comes to feeding picky eaters, they usually prefer the bland carbohydrates and the processed foods. These foods are low in nutrients, so kids can quickly become deficient in essential nutrients. These deficiencies can make their fussy eating even worse. So we want to focus on getting as much nutrition in as possible, but it’s often not easy if you have a fussy eater. Watch the video below or keep reading for tips to get more nutrition in when feeding picky eaters. 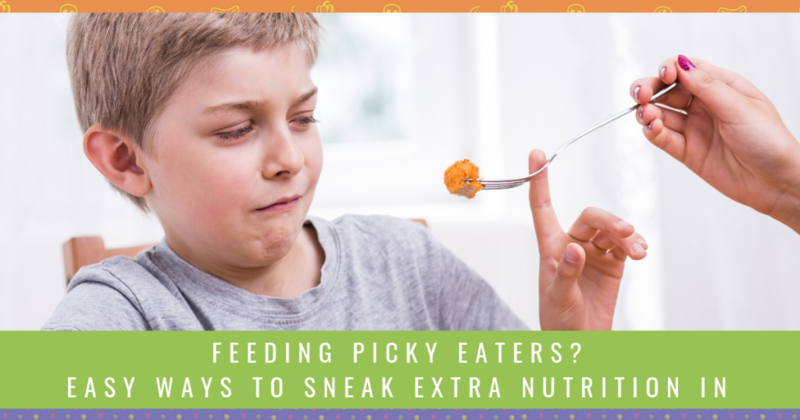 The easiest way to work with a picky eater is to add nutritious foods to the dishes they already like. This might be hiding the food completely, or it might just be preparing it as part of a favourite dish. It’s important to start slow and celebrate every victory. Even if you add a teaspoon of nutrition to your child’s dinner without complaint, it’s a win! When it comes to feeding picky eaters, vegetables are the most commonly rejected food. Many of my strategies focus on veggies because they are some of the most nutrient-rich foods in the diet. However, some kids will also have issues with meat-based protein or grains. 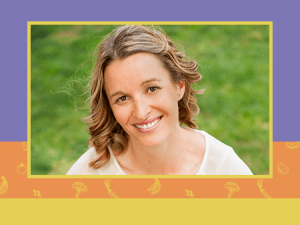 Here are some of my favourite go-to strategies for feeding picky eaters. Hopefully they will also inspire your creativity, so you can come up with your own strategies. Starting off with a nutritious breakfast is ideal, but many fussy kids go for bland, processed options. Here are some ideas to make brekkie a little more balanced. Grind up nuts and seeds like almonds and pumpkin seeds, and sprinkle 1/2 tsp over their cereal. This adds protein, healthy fats and essential minerals. Make some homemade granola using nuts, seeds and wholegrains, and add to their current cereal of choice. Add some fruit on top of their cereal. Change the milk to an alternative milk, or mix it in with normal milk. Coconut milk is a good option to boost up the healthy fat content and give them steady energy levels. Change the type of bread. This could be a wholegrain version of their current bread of choice, which will boost the fibre and nutrient content. Or you could try sourdough or spelt options, especially if they’re unwilling to eat bread that isn’t ‘white’. Change the topping. Put a small smear of avocado under their Vegemite and see if they notice. Nut butters are another nutrient-dense option for toast. Add a ‘sprinkle’ over the top such as ground up nuts and seeds or even a seaweed sprinkle if they prefer salty flavours. Switch wheat flour for wholemeal wheat, buckwheat or spelt flour – even white spelt is more nutritious than wheat flour. Add a teaspoon of chia seeds to the batter – this boosts the fibre and healthy fat content. Make ‘monster’ pancakes by adding spinach puree to the batter. Just make sure you don’t tell them you added spinach! Use mashed banana or berries as an ingredient or as a topping. Looking for a pancake recipe? Check out my Choc Banana Buckwheat Pancake recipe. Main meals tend to be where fussy eaters protest the most. But by tweaking their favourite dishes, you can keep them happy and give them a boost of nutrition. Grate or finely chop vegetables to add to the pasta sauce. My favourite additions include onion, celery, carrot, zucchini, cauliflower, broccoli, spinach and fresh tomatoes. If your child can spot a veggie a mile away, add puree of neutral vegetables such as zucchini and cauliflower. Use kangaroo mince as the protein for your meat sauce. Kangaroo is a clean protein that is very high in iron and zinc, but is also more environmentally friendly than beef. If you’re feeling brave, add some liver to the meat sauce. It is an incredibly nutritious food and is one of the best sources of iron. Traditionally, the way to overcome the distinct flavour of liver is to soak it in milk first. However, many foodies suggest that you can also soak it in water with a tablespoon or two of vinegar. Use bone broth as a base for your sauce. Broth is fantastic for supporting gut health and immunity. See some other ideas for using bone broth here. Add plenty of Italian herbs to the dish – think parsley, basil, oregano and garlic. For nachos, make it ‘loaded’ by adding a tomato & meat sauce. That way, you can sneak some veg into the sauce! Add beans into your taco meat sauce. They can be blended into a puree before adding if your child is particularly fussy. Use kangaroo mince as your protein. Add vegetables to your pizzas. My kids will eat foods like kale and beetroot when it’s on pizza, but they won’t eat it any other time! Make a pesto with parsley, basil and kale, and use it as the pizza sauce. If your child is particularly fussy, make a ‘plain’ cheese pizza. Blend cauliflower and mix it into the tomato sauce. Fussy kids tend to go for processed treats whenever they can. But you can still make them tasty treats that are secretly nutritious. If your child isn’t keen on protein, look for a protein powder that has minimal ingredients. Nutra Organics and 180 Nutrition are a couple of the brands I like for protein. Add some veggies! Cauliflower, zucchini, avocado and cucumber are a few to try. You can also add some baby spinach to chocolate smoothies, as the cocoa covers the green colour. Mix in some alternative milk such as coconut milk. You can even add a tablespoon of milk kefir. Use a teaspoon of cacao powder in chocolate smoothies. Cacao is an excellent source of minerals. Add date as a sweetener for any smoothie. 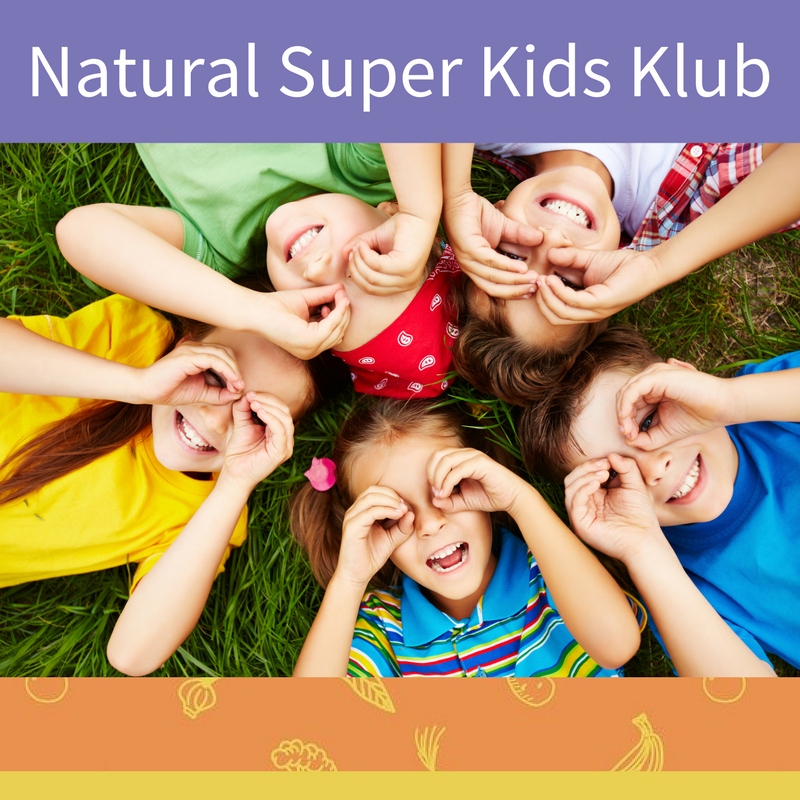 If you want to take the smoothie to the next level, Nutra Organics have a range of superfood powders for kids. Add grated or pureed veg to every baked treat you make! Muffins, bliss balls and brownie recipes can all hide veggies. If your child has sensory issues and prefers crunchy foods, try dehydrating vegetable slices to make ‘chips’. Include eggs, cheese and nuts into snacks as a source of protein for kids who don’t like meat. Not sure which nutritious foods you should be adding when you’re feeding picky eaters? 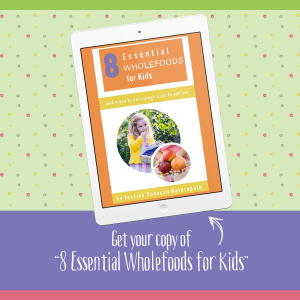 Download my free ebook, 8 Essential Wholefoods For Kids, here. 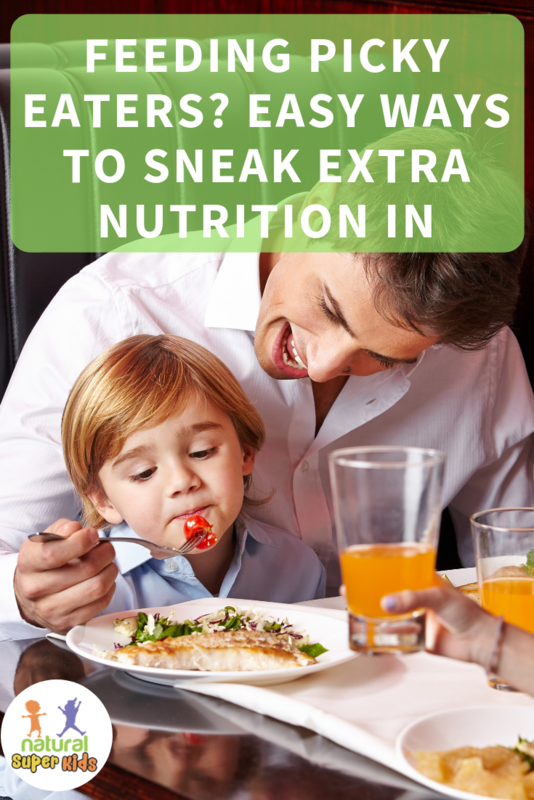 It takes you through the most important foods to focus on when it comes to your kids.